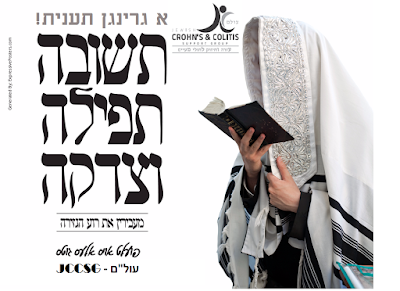 As the Yom Tov Pesach is approaching, we would like to Invite you to listen to a NEW important and informative interview in​​ Yiddish, discussing the Halachas regarding Arba Kosos, Shiurim of Matzah and Maror, and more. You can listen to it on the Kol Mevaser Hotline, at 212-444-1100, press 1-1-4. For any issue or emergency feel free to call us anytime, even during Shabbos/Yom-Tov, 718-635-2274. Please forward this email to all patients and their families who may benefit. 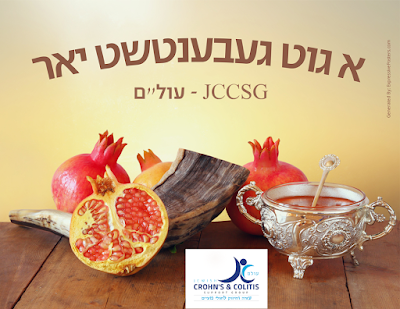 ​​We would like to wish you a Chag Kosher V'Samayach! A happy and healthy Yom Tov! A friendly reminder about the danger of mixing certain medications with alcohol. In some cases, alcohol interactions may decrease the effectiveness of medications or render them useless. In other cases, alcohol interactions may make drugs harmful or even toxic to your body, even in small amounts! We witnessed many patients taking Flagyl - Metronidazel and they drank alcohol having very unpleasant and some even life-threatening side effects, Therefore if you're taking Flagyl - Metronidazel, do NOT drink! (We pointed out one Antibiotic, but there are many more other medications with the same danger). In any case, each and every Crohn's and Colitis patient should double check with their doctor if drinking alcohol while taking your medication is safe, and if you're allowed to drink even a drop! Please be responsible! Do it for yourself and for your family. A Freilichen Purim! And Tumid B'Simcha! 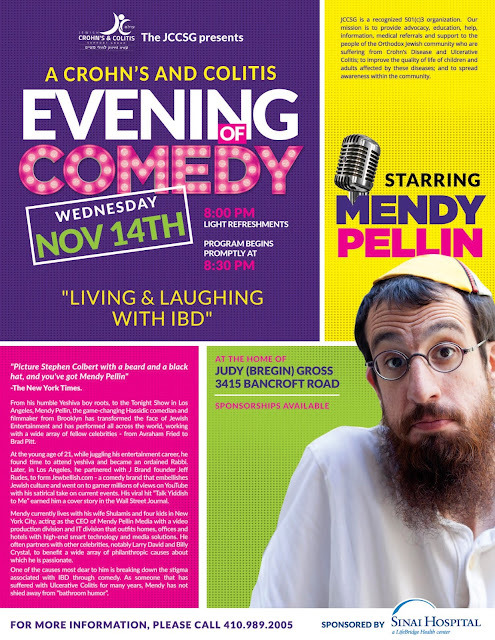 starring Mendy Pellin, famous Comedian and Actor! It will take place Wednesday, November 14, 2018, at 8:00 pm, at the home of Judy (Bregin) Gross, 3415 Bancroft Rd, Baltimore, MD 21215. We are looking to add an associate to our team. We are currently looking for a Director of Developments. 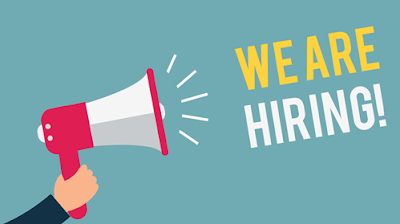 This position entails implementing a marketing strategy, spreading awareness of the organization and its cause, engendering community and volunteer participation, networking and communications, planning and organizing annual Fundraiser and other events and performing related duties. Highly aggressive, Motivated and enthusiastic. Marketing, Branding and Advertisement knowledge. Great potentials for the right candidate! If you're interested or know anyone that might be, please email us at Info@JCCSG.org. You can't join full 3 days? We listened! 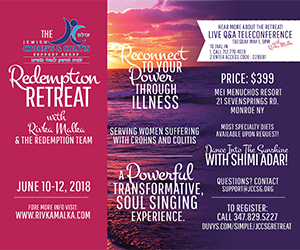 To those of you who wanted to join our fabulous retreat program, but can't make it for the full three days. We put together a program for Monday, June 11th to give you all an opportunity to join us in on the fun! You don’t have to miss out! Join us for an evening of friendship, fun, and support! 7:30-10:30 - Dance Party with Shimi Adar!! 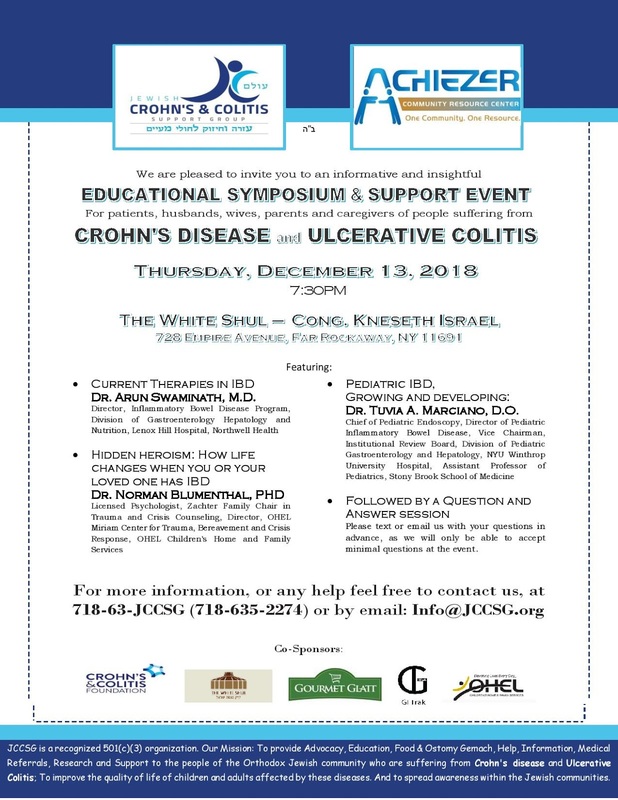 We -in conjunction with the Lev Rochel Bikur Cholim of Lakewood- are looking forward to seeing you TONIGHT at the informative and insightful Education Symposium & Support Event for Patients, Husbands, wives, parents, and caregivers of people suffering from Crohn's Disease and Ulcerative Colitis. The event will take place TONIGHT at 7:30pm promptly, At the headquarters of the Lev Rochel Bikur Cholim of Lakewood, 93 Prospect Street, Lakewood, NJ 08701, Parking available in adjacent parking lot. The Overwhelming demand and the positive feedback has inspired us to forge ahead with subsequent events, We -in conjunction with the Lev Rochel Bikur Cholim of Lakewood- are pleased to invite you to an informative and insightful Education Symposium & Support Event for Patients, Husbands, wives, parents, and caregivers of people suffering from Crohn's Disease and Ulcerative Colitis. The event will take place Tuesday, פרשת במדבר, May 15, 2018, 7:30pm promptly, At the headquarters of the Lev Rochel Bikur Cholim of Lakewood, 93 Prospect Street, Lakewood, NJ 08701, Parking available in adjacent parking lot. IBD & Shidduchim: Why Hide it? this June 10-12. Slots are filling up quickly! Save your slot now! It’s only $399.00, Which includes 3 days and 2 nights of accommodations, including food and supplies. Excited to announce our addition to the already great program! Dance Into The Sunshine: with SHIMI ADAR! Hear more about the retreat! 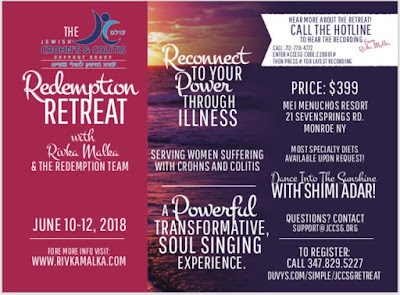 To make this retreat available to benefit as many people possible, we took upon ourselves to cover most of the expenses, and charging you way below the cost, it’s only $399.00, Which includes 3 days and 2 nights of accommodations, including food and supplies. Restroom access act in New York State is finally law! On Wednesday Governor Andrew Cuomo signed into law the Crohn's and Colitis Fairness Act. 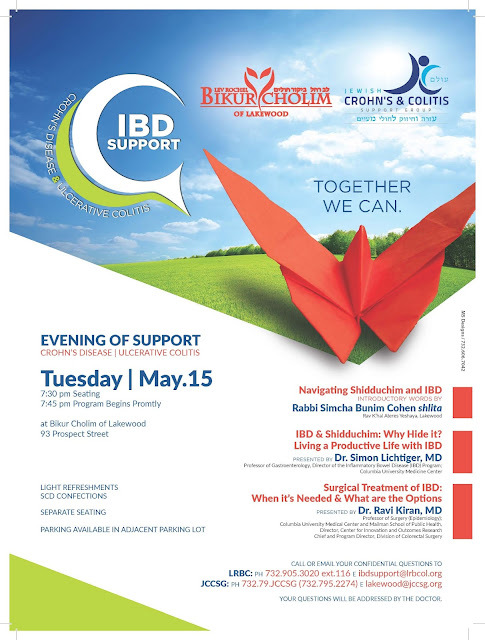 This could not have happened without the incredible support we got from you - you all have had a profound impact on the lives of the nearly 105,000 IBD patients in New York! Please stay tuned for updates and further details.